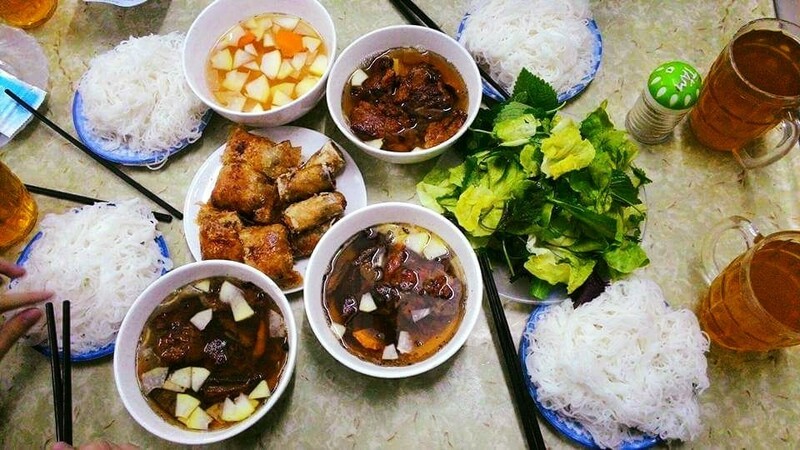 Would you like something for lunch which is fresh in summer June when Hanoi temperature is super hot at average 35 – 40 Celsius Degree? Being a typical traditional dish, nothing would be better for summer lunch than Bun Cha Hanoi. Originating from Hanoi, it is a popular dish in the Northern region of Vietnam. Described as fresh, tasty and delicious food, Bun Cha is a must-not-miss streetfood of Hanoi. 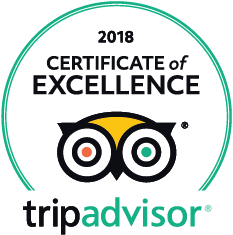 Plan your Hanoi walking tours in 2018 to enjoy Bun Cha Hanoi. 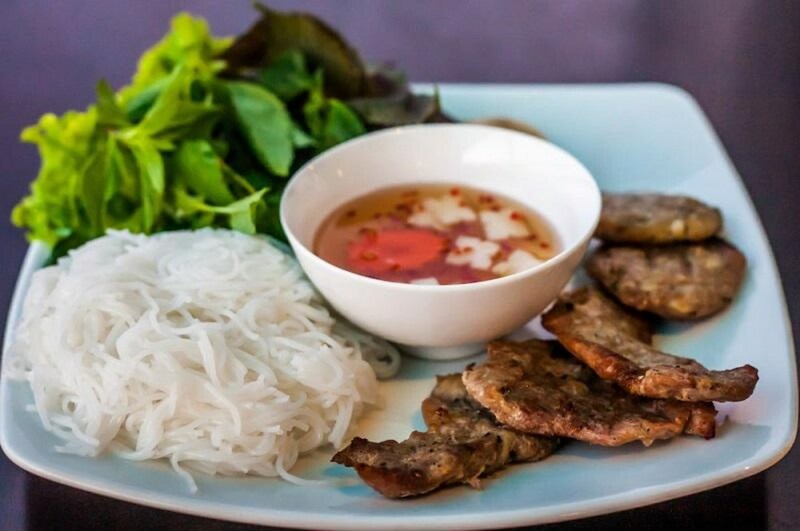 Bun Cha is the combining of Bun – white rice noodle (rice vermicelli) and Cha – grilled fatty pork. Bun is made of rice flour which is turned into small, circular and white threads making different shapes. For typical Bun Cha Hanoi, we often use stirred vermicelli. Also, because of the grilled pork, this dish is also commonly called BBQ Pork Noodles by foreigners. Bun Cha is served with a dish of stirred rice vermicelli, a dish full of vegetables and a bowl of fish sauce combined with vinegar, sugar, hot chilly, garlic and pepper. The sauce is made with a secret recipe containing all the essential tastes which are sour, hot, salty and sweet. Grilles powell-cooked pork would be opened and the contents dropped into the bowl of fish sauce. There are two kinds of Cha (grilled pork) used depending upon the cut of the meat. It is Cha Mieng (piece of grilled pork) when pork is cut into small pieces or Cha Bam (minced grilled pork) if the pork is minced prior to being shaped into small meatballs. Side fresh vegetables to eat with could be named like perilla leaves, Asian basil leaves, Vietnamese mint leaves, cilantro leaves, saw tooth coriander leaves, shiso leaves. They also serve fried crab spring rolls on order, which is also a delicious side dish going along well with the yummy sauce. Close your travel guidebooks with popular suggestions that all travelers may know. Let’s try delicious Bun Cha as Hanoians at local restaurants at much more reasonable costs. Bun Cha Cua Dong has long been judged by local people as the most “addictive” bun cha. Firstly, pork is grilled together with wild betel leaf that makes it smell so good. And for those who have tried Bun Cha at many restaurants often agree that there is plenty of meat for a bowl. 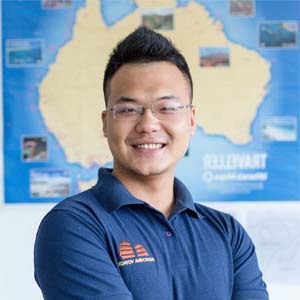 Bun Cha Hang Quat is very familiar with Hanoians. Although the restaurant is very small with just a few tables in an alley of Hanoi Old Quarter, it is always crowded thanks to tasty Bun Cha. Bun Cha Phat Loc is also known as Bun Cha Que Tre (grilled pork on the bamboo stick with noodle). Pork is carefully selected by the lady owner who has already had 30 years experience. She cuts it thickly – half lean half fat slices and then of course marinates with many spices before being grilled. I bet all gourmets will have an urge to eat bun cha while seeing the pork on skewers in the oven. Another place to enjoy Bun Cha that should be noted on your list is Bach Mai. Locals often share with each other than agree that bun cha here is very tasty. The restaurant is opened daily from 14:00 pm – a bit too late for lunch, yet still very early for dinner and the lady owner is also a little snobby. Maybe because of this reason, this place is called “bun cha-ching” – snobby restaurant. Yet, rumor has it bun cha served here is delicious so people come here to enjoy this dish anyway. You will be served a dish of rice noodles, grilled pork, sauce, and herbs separately while most of the restaurants often dip pork into sauce. Personally, I do not find sauce here very special, yet gilled pork is prominent. The meat smells so good, tasty. With the price of 40,000.00 – 50,000.00, relatively higher than bun cha at other places, bun cha Bach Mai is still crowded. It would be great if you could try Bun Cha Hanoi at all the places mentioned above and find your own favorite one. If you just have a few days in Hanoi in your Vietnam tours, let’s check on google map and find the nearest restaurant!